The Samsung Galaxy Watch is one stellar smartwatch. But just like traditional timepieces, it is not merely a utilitarian device, but a fashion accessory as well. Or it could be at least, depending on how you wear it. A good-looking watch always catches the eye, but if you add an outstanding strap or band, you can really make it stand out as a fashion accessory. 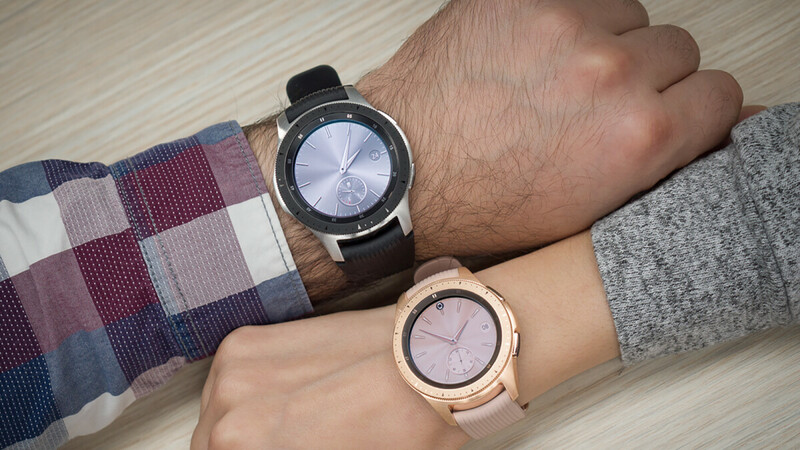 Thankfully, there's no shortage of great bands available for the two Samsung Galaxy Watch sizes — 42mm and 46mm — which are respectively compatible with 20mm and 22mm bands. With this in mind, we decided to pick our favorites among the best straps and bands available for the Samsung Galaxy Watch. Whether you're looking for something to match your outfit at a black tie event, or a durable, sporty band for running and exercising, you'll likely find something that suits your needs here. Minfex offers a number of replacement bands for the Galaxy Watch, and the classic stainless steel model is among the best. It's tough, yet good-looking, and is available in two sizes and three colors (black, silver, and rose gold). Still, no matter which size Galaxy Watch you own, you can't go wrong with the Minfex classic stainless steel band. Provided you like metal watch bands, of course. And if you don't, we've got a whole lot more down below – from genuine leather to rubber! I'm more of a leather watchstrap man myself, I must admit, though I've recently started appreciating metal and rubber bands on smartwatches. However, I still think some quality leather looks great on a stylish timepiece. If you're looking for something like that for your Samsung Galaxy Watch (and at a relatively affordable price), then this offering from Balerion might be right up your alley. Ah, Milanese watchstraps and their classic look. This fine-knit type of metal strap originated in the workshops that once turned Milan into the armor capital of the world and has since turned into a staple for wristwatch fashion and style. If elegance is your goal, you can rarely go wrong with a Milanese strap for your watch or smartwatch, and elegance is what this one has in spades. And at an affordable price, no less! The Aimtel stainless steel Milanese strap will set you back just $13.88. This soft silicone band is perfect for the Galaxy Watch and for, well, doing sports. If you need a band that can take some serious beating, and one that you wouldn't mind soaking in sweet, then the Kades soft silicone band would be a great choice. And at $8.99, why wouldn't you get something like it that you can swap out when you're in for some serious exercises? If you are looking for something sporty and light, then this nylon woven strap would be a good fit for your Samsung Galaxy Watch. It's lightweight, durable, and waterproof, so you can go swimming with it, no problem. It comes in two textured colors — gray and purple — and has a distinctive textile look to it that could potentially go along with a wide range of outfits. Best of all, the Olytop woven nylon strap is quite affordable at under 13 bucks. The Samsung Galaxy Watch can both look sporty and stylish, depending on how you wear it. This V-Moro dual tone band certainly help you achieve a sleeker look. It comes in various color versions— including black stainless steel links with blue resin inlays in between, and rose gold links with amber resin inlays—which look excellent on the black and rose gold models of the Galaxy Watch, respectively. This one may look like a regular ol' woven nylon strap, but its underside is coated with soft silicone for a more comfortable experience when working out. It's lightweight, durable, and water-resistant, so swimming (or profusely swetting) with it wouldn't be a problem. The Torotop nylon and silicone band comes in two colors – all black and dual tone black and blue. This is another classy-looking strap that just looks great on the Galaxy Watch. It comes in a number of different versions, as far as the number and size of the stainless steel links is concerned, and in three colors – blue, black, and silver. Whether you go for the "President" or the "Jubilee" design options, this is one good-looking, durable strap for your Samsung Galaxy Watch. Alright, this one is a bit odd, but it does look nice on the Galaxy Watch and could be very eye-catching on the right wrist, paired with the right attire. This strap is unique, in that it's comprised of stainless steel links—available both in black and silver—with wooden inlays in between. It's quite a striking look, and there's not many other products out there that have this unique style. One other option would be this hardwood strap, which turns things around by employing wooden links with stainless steel inlays between them.